In hindsight it seemed to me that the following topics have a common theme of causing us to question our own personal philosophy. Why should you take on this challenge? Well, perhaps you will end up finding Trust more beautiful than Understanding and Hearing better than Knowing. I also believe a shakeup is on the Lord’s agenda for these times, (Hebrews 12:26). 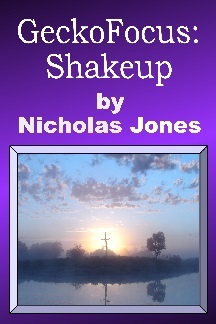 I have also released this collection in the adjacent eBook: “GeckoFocus: Shakeup”. We all have a personal philosophy. Where the Church in Jerusalem lost the plot. The early Church was empowered by an imminent expectation of Jesus return. The early Gentile Churches possessed an innocence before God. Peter misses the point again. Lots of good stuff but don’t go here without the Holy Spirit. Plain talk from Jesus, but we miss it. When does God say life starts? God reflected in our Anatomy.